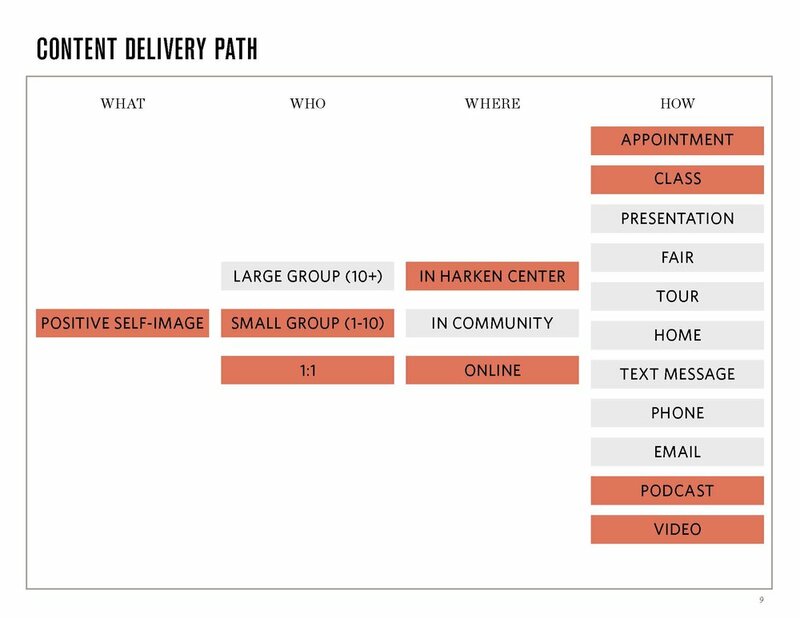 Development of a personalized wellness curriculum to deliver a consistent experience across all 12 Harken Centers and elevate the role of our Health Coaches. How might we utilize our health coaches to deliver meaningful information based on a member's needs and goals? Eliminate wellness programs and create a Health Coaching curriculum. 4 or 6-week programs inherently have scheduling and timing conflicts. 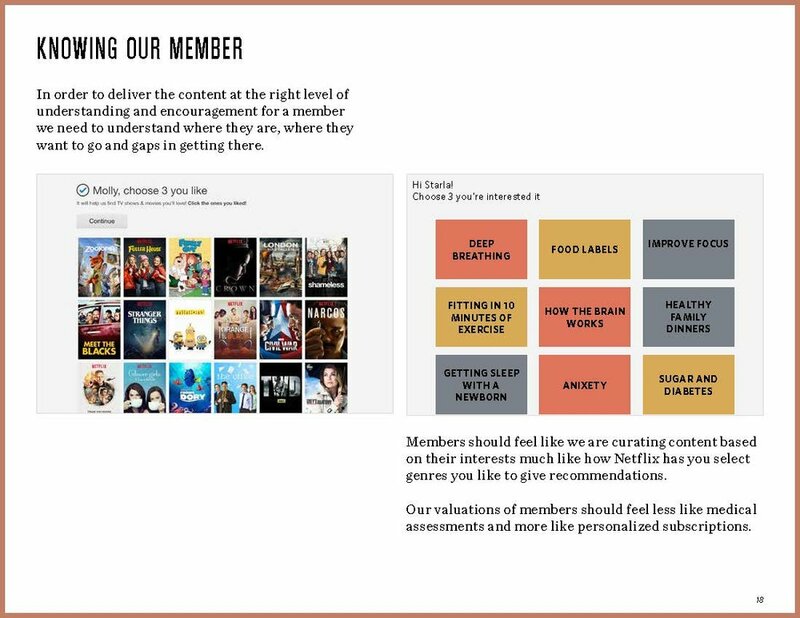 While some members enjoyed a group setting most really needed personalized content on their time. 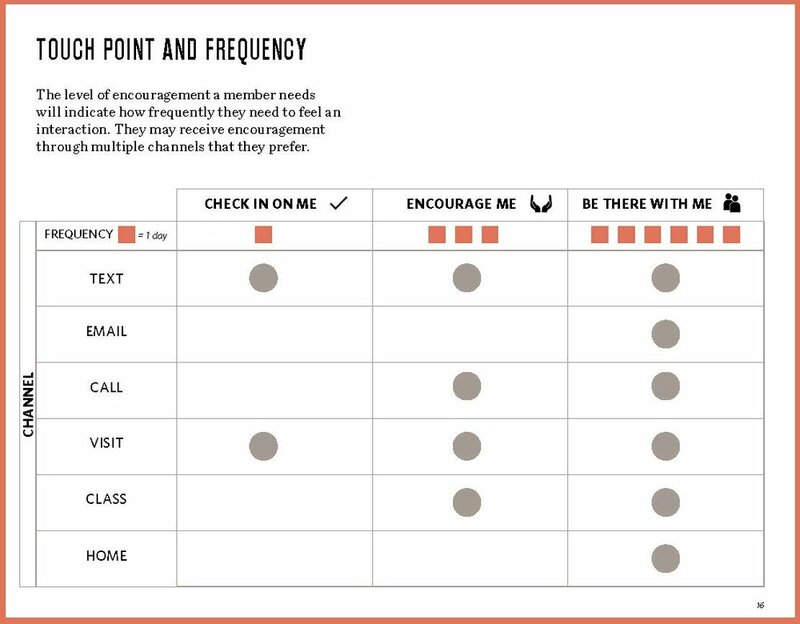 We needed to create a curriculum that Coaches could implement on a member’s very first visit or 10th visit. Repeatable tools with individualized outcomes. Our Health Coaches all had various backgrounds and did not follow a standard protocol. This led to inconsistency in Member’s experiences and lack of confidence in Coaching skills. 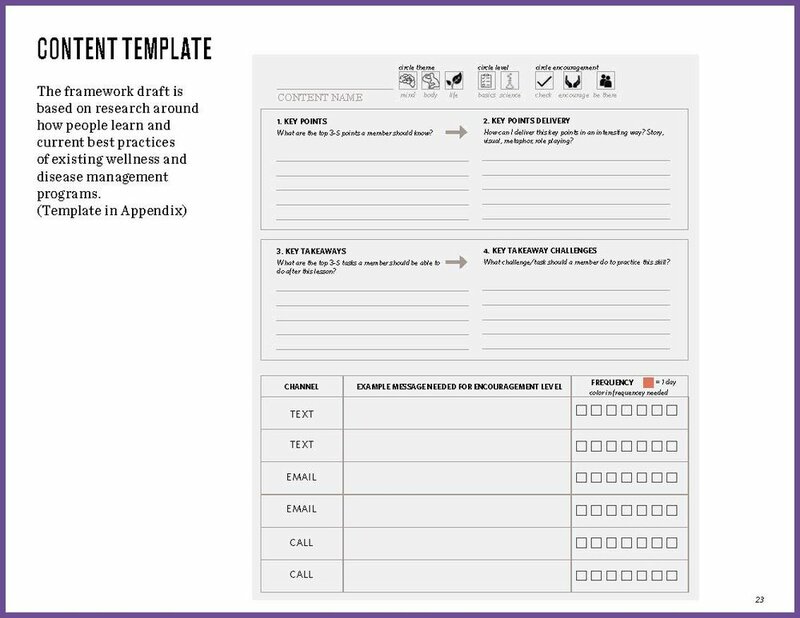 We needed a set of tools as apart of the curriculum that would create a standard practice, while preserve the personalization to an individual Member. Make the Coach relatable. Coaches needed to share personal stories with Members to help establish a connection. Many Members didn't bother opening up to their Health Coach (who were usually young and fit) because Member’s didn’t feel like their health coach could relate to their experiences. Meet members where they are, not where you think they should be. Members shared horror stories of other places telling them to drink only protein shakes, or go to the gym every day, only to be set up for failure. Members appreciated when Health Coaches approached recommendations as a lifestyle change and gave incremental changes that fit into their life. Make information actionable. Members didn't just want the theory on a topic. They wanted tactics, tools and clear takeaways of what to do with the information they were presented. Our workshop session with Health Coaches and Providers from multiple Centers lead to the creation of a personalized wellness curriculum that took into account a Member’s learning style, current ability to make changes, topics of interest and level of knowledge desired. 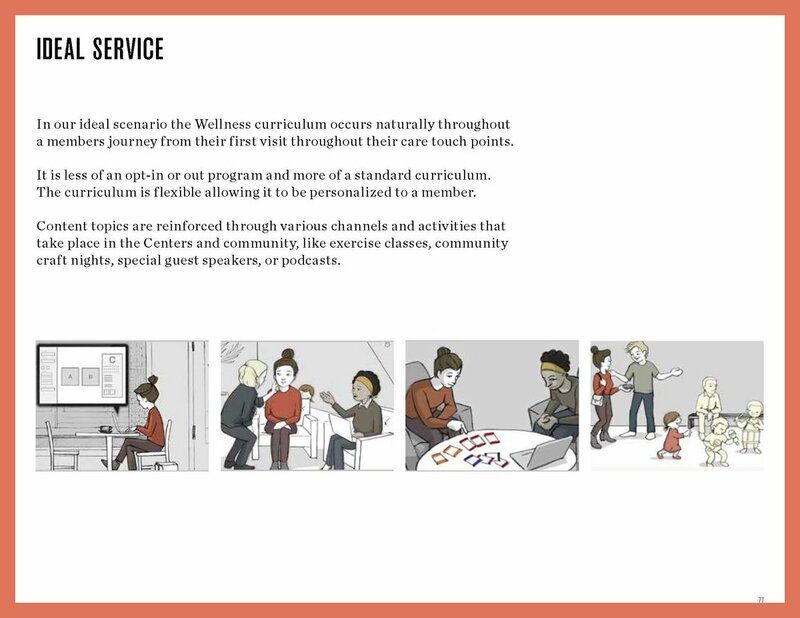 The Wellness Curriculum walks a Member through a series of tools to identify: their top topics of interest, areas where they need support, their current knowledge level and their willingness to make a change. 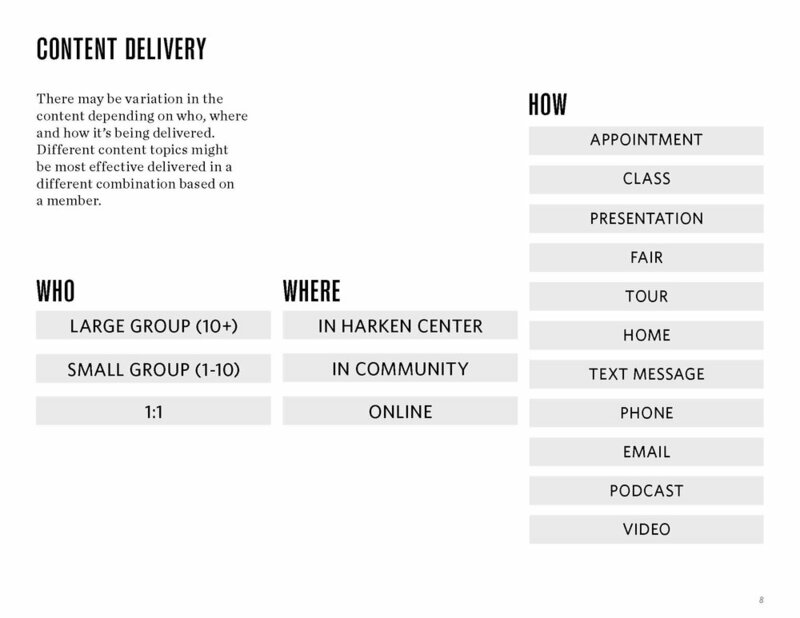 The output indicates what content and techniques the Health Coach can leverage to deliver a personalized plan to the member. This database houses content, techniques and examples for Care Team members to use in order to deliver a consistent experience across all Centers and reduce the amount of time spent on making content. After the workshop, Health Coaches in both Chicago and Atlanta split into two teams, one focused on the tools and the other on content. 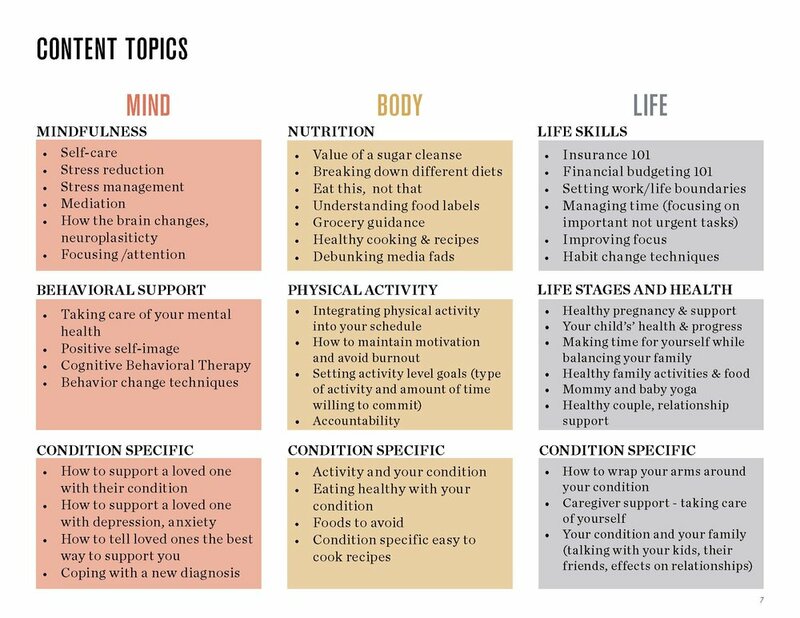 The content team created a template to structure the various topics so that any health coach could deliver the information regardless of their background and training. I guided the Care Teams through how to prototype, provided resources and reassured them when they became uncomfortable with the ambiguity of not knowing what the final product would be. I instructed the Care Teams to develop prototypes ranging from very literal (i.e. survey questions) to abstract (i.e. metaphors / images) to stretch their creativity.